Among Americans’ top must-haves is an area for socializing, relaxing, and enjoying the outdoors in comfort. Make your outdoor room inviting – transform it from just another space into to a fully realized (and utilized!) room. SEATING – Go a step up from that wobbly folding lawn chair. 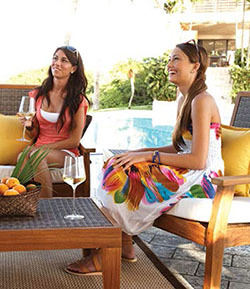 Modern outdoor furniture is stylish, sturdy, and built from a variety of weather-resistant materials, requiring little to no maintenance. Cushion fabrics are just as fashionable as indoor upholstery options, and maintain their color better than ever. Arrange a seating grouping that encourages conversation, and keep your guests comfy with plenty of pillows to lounge on. DINING AREA – Firing up the barbecue grill and eating outdoors is big part of summer. 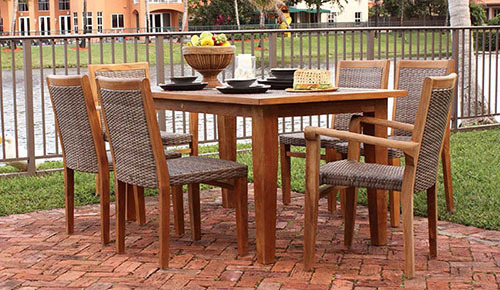 Food can go straight from the grill to the table with an outdoor dining set. Whether you’re enjoying your morning coffee on the porch or hosting the neighborhood party, every meal is a picnic. Keep a basket stocked with silverware and napkins and place it in the center of the table. SHADE – Your guests will thank you for a bit of shelter from the blazing sun. Without shade, they’ll get too uncomfortable and head for cover indoors. A patio umbrella provides shade and gives a sense of enclosure that you might want around a dining area, for instance. Some umbrellas can tilt and turn to be readjusted throughout the day. RUGS – Comfy under bare feet and durable against the elements, an outdoor rug will make your space feel more like an extension of your home. An all-weather rug will provide some pattern and personality and serve to anchor the rest of your furnishings. Bring the indoors…out! LINENS – Spread out a nice tablecloth, and with that simple touch you instantly elevate any outdoor dining experience into a special occasion. For some extra privacy, shade, or to give your room a tropical vibe, hang some sheer outdoor curtains. They’ll catch the breeze, draw the eye, and form a tranquil secluded setting. ILLUMINATION – As your party carries on into the night, your lighting scheme becomes your outdoor room’s new backdrop. A solar powered string of bulbs is always appropriately festive, good for safety, and a practical option if you’re short on electrical outlets outside. Criss-cross them overhead, line the walkway, or wrap them around a tree. Candles glowing inside lanterns will certainly create an intimate effect. Add some soft, diffuse light from a pendant or wall-mounted fixture; find a style to match your space or architecture. FIRE – Everyone naturally gravitates toward an open fire when the sun goes down. A fire pit offers the ultimate in outdoor ambiance: the crackling flames of an open fire. They’re available in wood- or gas-burning varieties – either works for marshmallows! This feature also extends your outdoor living season since you can gather round when weather starts to get cool. WATER FEATURE – Even the simplest fountain or pond can put you in touch with nature with the relaxing sound of running water. A water feature makes a nice backyard focal point. Your outdoor space is a part of your home. 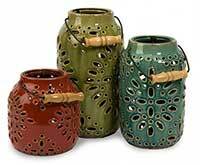 It beautifies your property and adds comfort to your day. Make it the perfect haven for spending time with family and friends.